LET THE COASTAL LUXURY BEGIN! Perched approximately 300 metres from the crystal-clear waters of the Indian Ocean on a low-maintenance 511sqm (approx.) 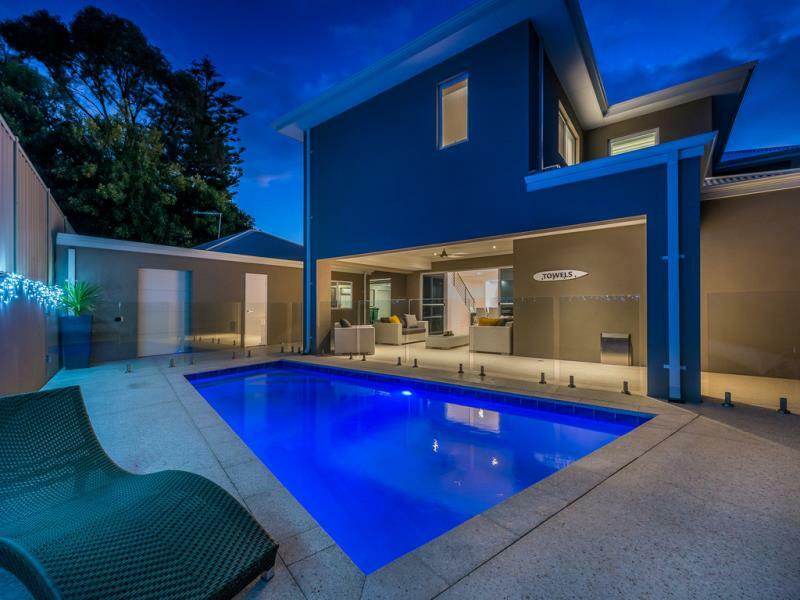 block atop a tranquil cul-de-sac in old Burns Beach, this stunning architecturally-designed 4-bedroom 2-bathroom home enjoys the best of everything, spanning two spectacular levels, having only been owner-built barely one year ago. 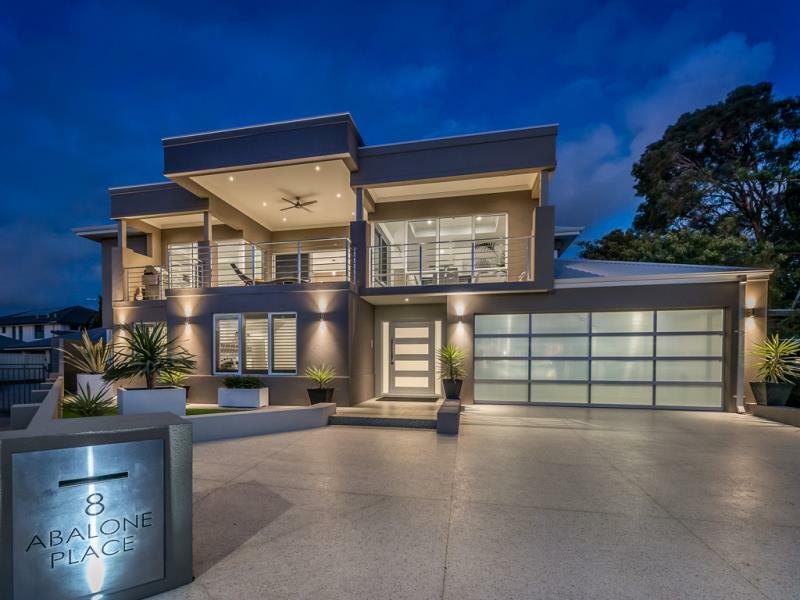 Varying colours add modern character to an impressive facade, highlighted by honed concrete to the driveway, also prevalent at the rear where a private alfresco entertaining area overlooks a shimmering below-ground swimming pool. Extending out to the alfresco itself is a tiled downstairs activity room, boasting a stylish stone kitchenette for when your guests drop by, as well as double doors that reveal a carpeted home theatre - complete with an elevated cinema-style seating area. Also, on the ground floor is a fully-tiled main bathroom (with a separate bath, shower and stone vanity) that services the minor sleeping quarters, as well as a giant four-car garage with drive-through access into a huge powered workshop - or even an additional remote-controlled double garage, depending on your family's personal needs. Upstairs, an open-plan family and dining area allows the sleekest of kitchens to take centre stage, headlined by a massive five-metre island/bench breakfast bar, solid 40mm waterfall-edge stone tops, a walk-in pantry, quality square-crystal glass light fittings, a double sink, feature bulkhead ceiling, glass splashbacks, a Bosch dishwasher and high-end 900mm Bosch appliances, including an Induction cook top, oven and range hood. The main living zone opens out to a magnificent tiled front balcony, with its own ceiling fan, power connection and breathtaking sea views in the background. An upper-level carpeted study/home office is more than generous, whilst a separate set of double doors adds serenity to a five-star master bedroom suite, enhanced by soaring high ceilings, a new fully-fitted walk-in wardrobe and an enormous hotel-style ensuite bathroom with floor-to-ceiling tiling, a bubbling spa bath with a sheer descent waterfall feature, large stone twin vanities, an over-sized double shower with square drains and a separate fully-tiled toilet. 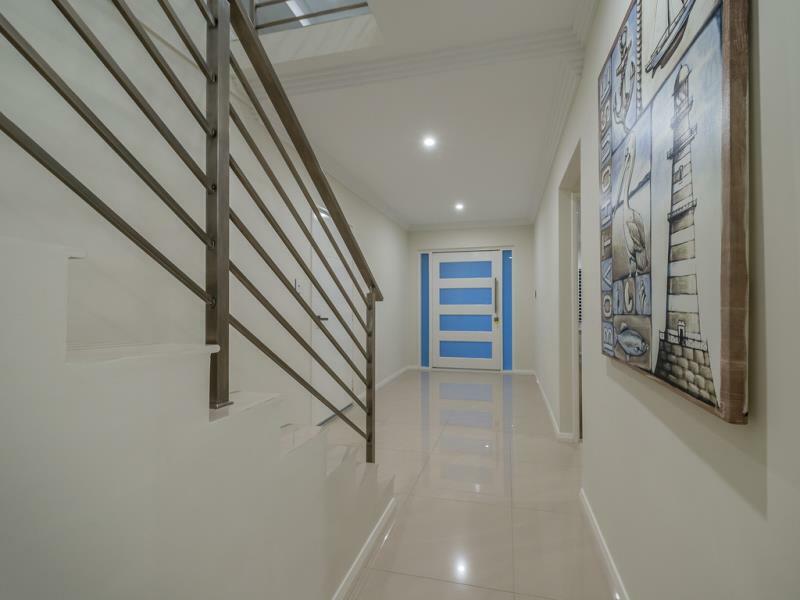 If you are seeking a near-new double-storey residence in a special and iconic location, then look no further - this exemplary abode is perfectly positioned within footsteps of the surf, sand and beachside parklands. Your summer starts here!